BEIJING, Sept. 1,Chinese President Xi Jinping met with Liberian President George Weah on Saturday ahead of the 2018 Beijing Summit of the Forum on China-Africa Cooperation (FOCAC). Xi said friendship between China and Liberia serves the fundamental interests of the two countries and the two peoples. 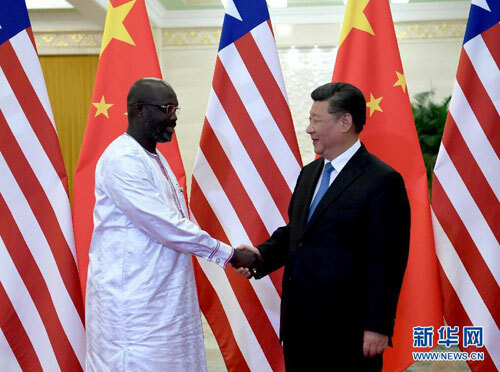 China appreciates the firm and clear-cut position of President Weah and Liberia's new government on the one-China principle and is willing to enhance exchanges at all levels, said Xi. China will strengthen bilateral cooperation on various fields including poverty reduction, agriculture, infrastructure construction and health, said Xi, adding that the two countries should continue to show mutual understanding and support each other on issues involving their respective core interests and major concerns. China has helped promote Liberia's peace process and will continue to stand up and speak for Liberia in multilateral institutions, said Xi. "Mr. President used to be a world football star and is deeply loved by Chinese fans," said Xi, hoping the Liberian president will use his special influence to promote the sports and youth exchanges between the two countries. Weah said Liberia firmly adheres to the one-China policy and is grateful for China's valuable support, especially the selfless help in Liberia's fight against the Ebola epidemic. The mutually beneficial cooperation between the two countries has brought tangible benefits to the Liberian people. Liberia supports and is willing to take part in the Belt and Road cooperation, said Weah. Weah said Liberia supports China hosting the Beijing Summit of the FOCAC, adding that he is willing to make more contributions to enhance friendship between the two peoples.